It’s such a pleasure to tune in to your favorite channels and listen to music while having fun on the water. With the Best Marine Stereo, you can create a party atmosphere and invite your friends to chill along with you during your next boat outing. Marine stereos are nothing like car stereos. They may go in the middle of the dashboard, but from the installation process to the way they are built, you are looking at different products that are built to very different specifications and designed for very different environments. How Many Drivers (speakers) Will You Need? What is RMS Rating on Speakers and Why is it Important? How many watts will you need in your marine system? What about Wireless, Waterproof Bluetooth Speakers? Car audio components are usually found in the dash or glove compartment of your car where they are well-protected from the sun, rain, and the harsh UV rays. But a marine stereo is exposed to the weather from the very beginning. When your boat is in the marina, it has to endure days and months of the sun beating down on it plus corrosion from the rain, salt water, fog, snow, etc. unless you store your boat in a covered marina which is very expensive. While having a boat cover will help it still will not protect your marine stereo completely from the environment. That’s why marine stereo systems have to undergo rigorous testing in carefully designed chambers to mimic years of abuse from the elements. If you want an audio system for your boat, it is better to stick to marine-rated stereos that can stand up to extreme temperatures and the continuous exposure to the harsh environment. Some brands have made it big in this industry with the capacity to build marine stereos that can endure years and years of daily use out on the water. Because marine stereos have to be built to withstand so much they are more expensive than regular stereos. Fusion Entertainment is a renowned industry leader in the field of car audio and marine audio. They have been around for twenty years have propelled themselves to the top of the game as they now produce high-end, high-quality, and highly sought after marine stereos and other marine audio accessories. You can expect to find waterproof marine stereos that are NMEA Network compatible. This means that you can interface their marine stereos with fish finders, chart plots, and other devices that are NMEA compatible. ​This company also contends for the top seat in marine engineering and technology. After spearheading the car audio revolution, they have moved on to marine audio engineering to fit your lifestyle. Their amplifiers and speakers are ideal to make your marine stereo sound great. Their gear is attractively designed, and their amp power matches that from most speakers to make pairing easy. ​This company is known for producing highly sophisticated audio and video products. It is a well-respected company as their marine speakers and receiver systems produce terrific sound and outlast many products on the market. ​Boss Audio has been around for more than 30 years. Their marine audio products are among the top performing and longest-lasting brands. 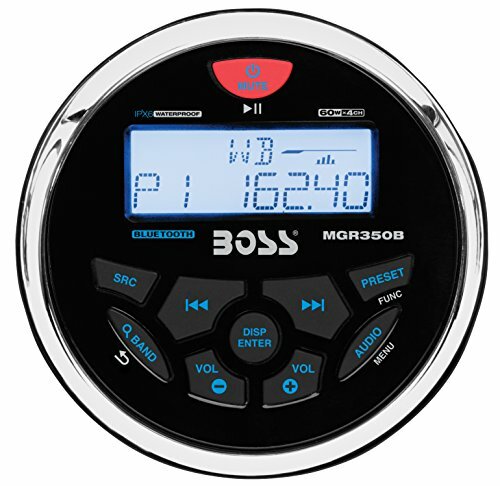 You will find only innovative and well-crafted aquatic stereo systems from Boss Audio. This California based company has made its name in this industry through customer satisfaction. They have a wide selection of marine audio systems aimed at giving you the perfect soundtrack for your life on the water. Before Choosing a Marine Stereo it is important to know what many of the features and specifications mean to help make sure you chose the best stereo for yourself. ​If a marine stereo system is water resistant, it indicates it can withstand direct water splashes from the rain, when washing the boat or rough water. It cannot be entirely submerged in water though since water will damage the interior components. 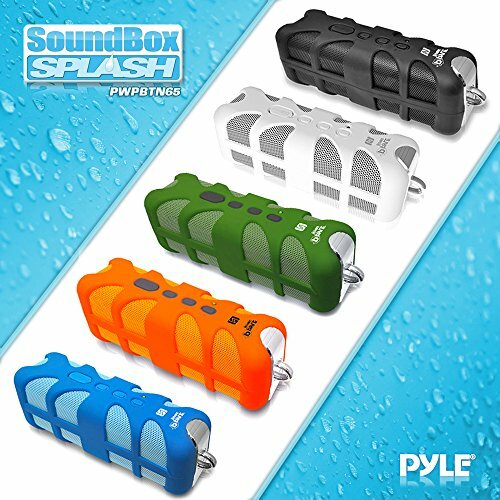 ​A system that is completely waterproof is submersible underwater to the depth that the manufacturer has tested it to. It can be a meter or up to 30 meters, and it is usually up to a specific period of time such as 30 minutes. These are components coated with substances that prevent the corrosive effects of exposure to salt water. You will notice that the words coated are used to signify it can resist rust. This is very important if you will be using your boat in salt or brackish water. These words are mostly used on marine stereos to indicate they can withstand the sun's UV rays which can quickly damage unprotected plastic. When a stereo system has undergone marinization, it means it has been built for long-term use in the harsh marine environment. This applies whether you are using it in fresh or saltwater. Marinisation covers everything including corrosion, UV-stability, and waterproofing. And now let's take a closer look at the best marine stereo systems on the market. When you want to bring your best tunes to a boat or beach party, Poweradd offers an excellent speaker that sounds great with an outstanding loud volume. With an IPX7 waterproof rating, it is perfectly designed to be around water. Don’t you worry if you accidentally drop it in the water as this will not affect its speakers. This Bluetooth speaker is supplied with a micro USB charging cable, welcome card, audio cable, 1-year warranty certificate, and it is protected under a 30-day return policy. 3.5mm audio cable provides connectivity to non-Bluetooth devices. 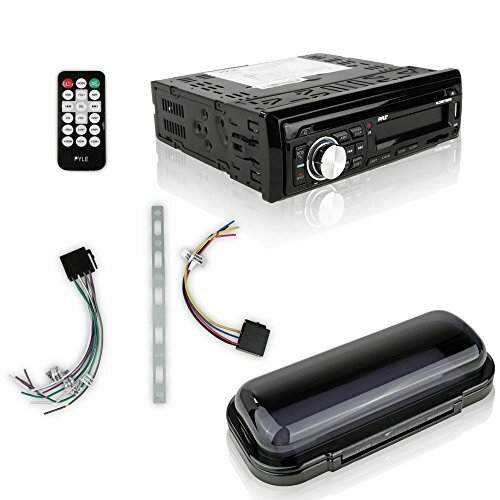 If you are searching for quality in one package, you got it in this JVC Marine Stereo Kit. It is a well-rounded bundle with high-quality audio parts. These include the six 6.5-inch Dual Cone Enrock Marine speakers which are powerful enough to blast music thanks to the 180W maximum power. They can withstand the roughest conditions so don’t fret about saltwater or leaving your boat exposed to the sun. You will also receive a JVC stereo receiver, 400W Pyle Stereo Audio Amplifier, Enrock Wire Stereo Antenna, 16g speaker wire, and a JVC remote control. The Fusion Elec. 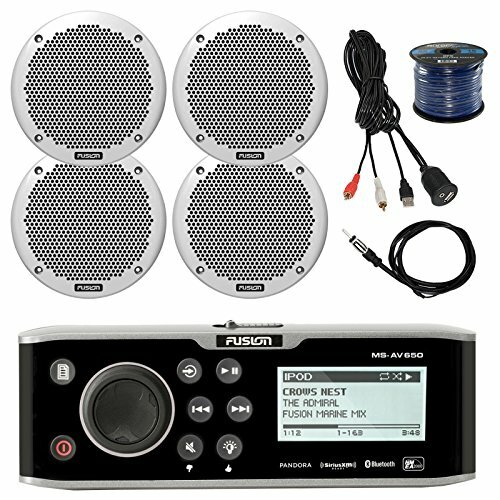 Bay Boat Audio Package is a quality system that will make your time more enjoyable on the water. It offers the perfect marine stereo solution if you are looking to buy everything as a package. This is a premium package and is more expensive however the quality is components make it worth it. You can easily fill your boat with sound whether you are cruising at high speeds or low speeds. Boss audio produces impressive audio equipment. 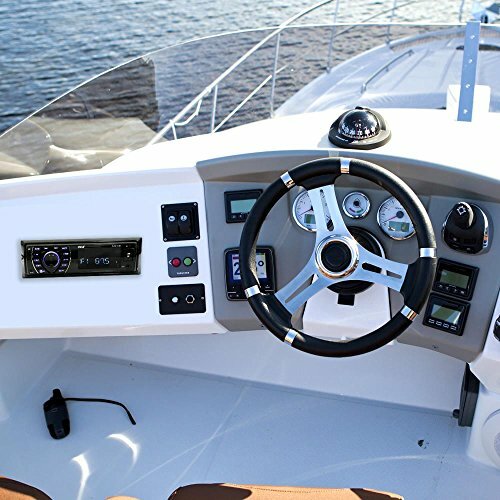 The Boss Audio MGR35OB In-Dash Marine Receiver sets a standard for what marine receivers should look like. The functionality of this model is top notch seeing that it is Bluetooth enabled to control other smart apps like Spotify and Pandora. While this receiver does not include a CD player with the Bluetooth capability and great price we don’t feel that the CD player will be missed. Although the water proof rating is only IPX6 again for the price this is a great buy. 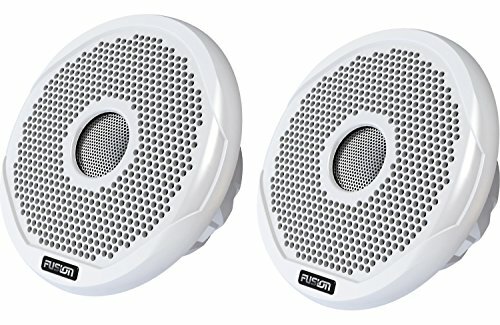 Fusion Electronics aims at producing the most reliable marine speakers. These speakers feature a flush mount profile and remain elegant to match the interior of your vessel. You can mount these speakers either on the wall or on the ceiling to receive immersive sounds. NOTE - Currently you can buy this package for the same price as the amp by itself so we have included the package here. 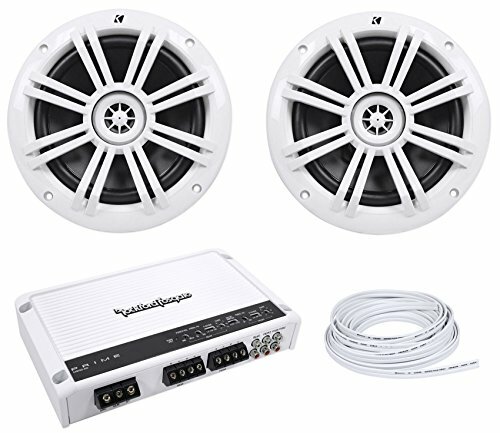 The M-600-4D Marine Amplifier by Rockford Fosgate is a Class-D Marine Amplifier. It is highly efficient featuring an Onboard Punch EQ, Marine-Grade PC board, Tri-State Protection Circuits, and variable crossover. It is efficient every way you look at it thanks to the Class-D circuit topology and PEQ with 18dB of boost. From a company that leads in innovation, this amplifier is about wow your water activities. Currently a package deal that includes speakers for the same price! There are many things to consider when looking to purchase the best marine stereo system for you need sand budget and it can get quite complex. Below are some of the most important things to consider as you start looking for your boats stereo system. One of the first questions will you need to answer is whether you will need to build a stereo system from scratch or buy one as a bundle. When you choose to buy build one, you will likely get the best pieces to customize your stereo system, but it will cost more and you will have to either install the separate pieces yourself or pay extra to have them installed. On the other hand, buying a stereo system as a package is pretty straightforward. But you have to be careful to choose only from brands that are known to have high-quality products. A marine stereo receiver with a water-resistant faceplate and a coated circuit board is your best choice if you want it to last more than a couple seasons. Do not forget to look for satellite radio controls and line-level outputs. These components are useful for sending signals to the external amplifier. You will want first to identify the DIN size you have on your boat before you replace an old stereo receiver. The most common DIN size is the single-DIN receiver. These are around 2 inches tall and 7 inches wide. They fit on a wide variety of boats especially small ones because they do not have an inbuilt CD player. 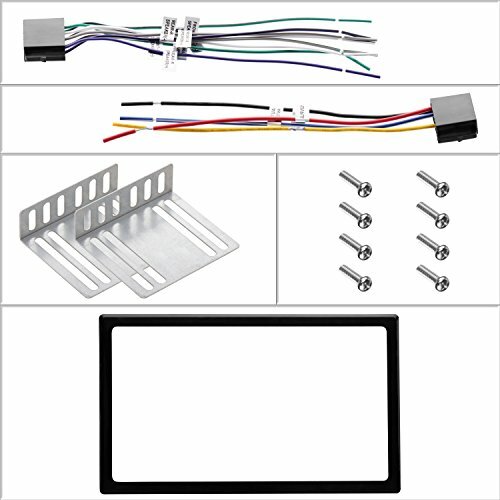 If you are replacing an oversize DIN receiver, then you will want to ensure you don’t get a single-DIN model as it will be too small for your oversized DIN and you will have to modify your DIN space which may be difficult to do. Ensure that the depth of the cavity is enough to accommodate the stereo receiver. For speaker installations, you will be presented with a whole set of new challenges. This is because the speaker size presented by the manufacturer is that of the internal cone, not the diameter of the grille. 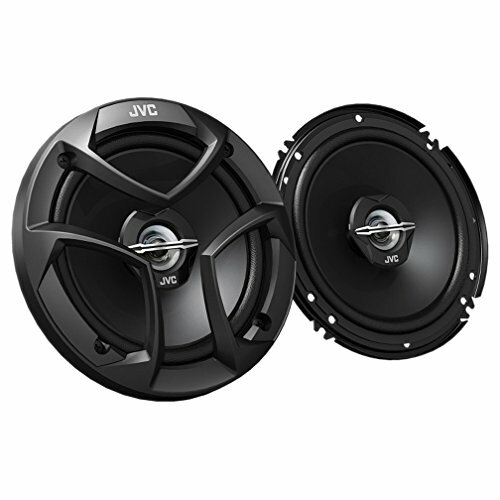 You may find that even if two speakers from different brands are listed to have the same cone size, they may not share the same grille size. It means you either have to replace an old speaker or get lucky and find one with similar size dimensions as your last. It is best if you install large speakers because they have a better frequency response. Otherwise, you want to know the grille size for new speakers before drilling in the space that you intend to install them in. Inputs and data sources are essential for a marine stereo system. You will definitely want to connect your iPhone, iPod or Android. As such, your stereo should have connectivity options like Bluetooth, Spotify internet, Pandora, and other options for integrating the speaker with your smart devices. Bluetooth allows you to listen to music that you stream directly from your smartphone and other devices. You can also receive calls when your phone is connected without taking your hands off the helm. We feel that Bluetooth connectivity is a must for any marine stereo as it allows anyone to quickly and easily play their music or podcasts while out on the water. Multiple AUX and USB connections also let you plug in MP3 players and your smartphone for the ultimate entertainment whether you are docked or on water. If you plan on getting a large system, it is vital that you go for marine stereo receivers that can accommodate multiple preamp output sets. This way, you will easily be able to connect and control more subwoofers and external amplifiers when building your custom marine system; this is especially important on a larger boat. You should look for auxiliary audio/video outputs and inputs to expand your system even further when you want to connect a TV or a portable music player. An internal docking station is built to protect your marine stereo system from the open climate. If you can get one, it will be better since it will improve the longevity of your stereo system. For those that do not have docking stations, you can look for a detachable face on the receiver. You remove the control panel of the stereo when you leave the boat which means that thieves will be less tempted to ransack your vessel as the stereo is useless without the control panel. Your stereo system will consist of different gear from receivers, marine speakers, marine amplifiers, etc. You will notice a rating indicated with the symbols IP (Ingress Protection) in front of it. A rating of IPX7 and IP8 is considered waterproof by US IP standards. These are devices that can withstand full immersion in the water without damage. 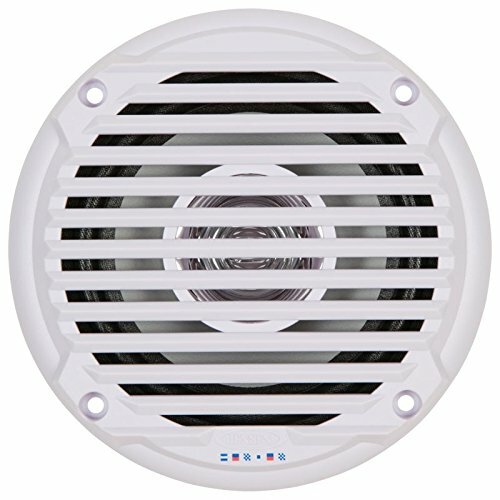 Flush mount speakers are attractive but need a hole to be cut in your boat. You can easily find an ideal space like a hidden corner away from other components. They need to be installed in a closed compartment and with adequate space behind them. The last thing you want is to leave the magnets of the speaker hanging outside or with too little space behind them. A reasonable level of enclosure, especially on the back side, is required to maintain the sound quality. Box speakers come in a box enclosure. As such, they will not need a space to be cut for them on the boat. Their sound is not affected by the method you use to install them. Box speakers come with gimbal brackets for simple installation on a high part of the boat. But they take up a lot of space which makes them not ideal for smaller boats. The next thing is to determine whether you will need triaxial, coaxial, or dual cone speakers; also sometimes referred to as drivers. Coaxial speakers: Also known as two-way speakers, reproduce a wide range of audio frequencies from a single unit. They are the least expensive of the three types since they come with a woofer and a separate tweeter that can handle high frequencies. Triaxial speakers: These speakers contain a mid-range besides the woofer and tweeter. They are usually in the configuration of the low-range woofer, mid-range, and high range tweeter. They can deliver more fidelity for better sound quality. Dual Cone Speakers: These speakers use an inexpensive design where they utilize one speaker and two high-frequency cones (wheezers), to perform the work of the midrange and tweeter woofers in speaker. Their sound quality is impressive with a high-quality model, but you might not find them adequate on a large boat. As we said, you need to match the power output of the amplifier to the handling capacity of the speakers. RMS is a measure of the continuous power that a speaker can handle, or an amplifier can output. Every company has their method of calculating RMS which is a real kicker when comparing marine audio products. As such, always pick the highest RMS rating on your speakers; with your amplifier having a lower RMS rating to ensure you don’t damage your speakers. This is a matter of preference. If you enjoy loud music for holding parties, there’s no need to skimp on the wattage on both the amplifier and the speakers. As long as you have matched the power needs of the two components, then the higher, the better. Small size vessels like ski and fishing boats do not require as much wattage as that of cruise boat marine systems. Also, if you plan to cruise on open waters, your sound will be drowned by the waves, so you will need more wattage on your boat that you would in your car. Magnetic interference is referred to as unwanted signals that interferes with the desired signal. It is mostly heard as a stutter, hissing, crackle or popping sound on loud speakers. On your boat, it can be generated by the electric system which can interfere with the radio equipment. The noises are either conducted into the stereo system along the wiring leads and power leads into the system or through the radio antenna. You will need to first locate the source of the magnetic interference before attempting to shield or suppress it. You can do this by leaving the speakers on while shutting various electric equipment and then noting the changes in the sound on the speakers. You can also identify the noise when you move various parts/electronics of the boat around. After identifying the source. You can shield your system by applying various shielding techniques like running transducer cables separately, or enclosing the noise source in a metal can. In other cases, you can screen out the noise by using shielded wiring. How you install your marine system directly impacts the sound quality. Attention to detail is our mantra in this section. If you are installing old speakers, it makes sense to use the same location for the speaker space and wiring. If you have never installed speakers on a boat before, you will have to be more careful in the way you install flush mount speakers. First, they will need adequate space behind them. If you confine flush speakers, the diaphragm will not move back and forth effectively which means the sound will not be produced efficiently. Always allow around 1 cubic foot space behind flush speakers giving room for an air path from the front to the back of the speakers. For box speakers, it is as simple as drilling holes for the speaker wire and screwing the speakers in an ideal location. The cables can easily be bundled up neatly behind the bulkhead using wire ties. Install the speakers to face your ears in an open boat - Speakers produce their best sound along with their central axis. It is then reflected in a pattern of 45 degrees along the axis. If you are not in the radiating zone, then the speakers will not sound powerful. Bluetooth speakers are a good option if you need a temporary music solution or don’t have enough time to install a marine stereo system. They are a quick way of listening to music from your phone or tablet without wiring receivers and radios into the boat’s battery system. They can be very useful if you are renting a boat or have a small fishing boat and don’t want to go to the trouble or expense of installing a stereo system. Portable - Bluetooth speakers come in many sizes from small to large. They can easily be carried from one location to the next in a backpack. You don’t need to restrict the location as you can have it in the boat or on the beach. Whichever place that suits your friends, a Bluetooth speaker will go. Waterproof - These speakers have high IP ratings to ensure their components will not be damaged if it falls into the water. Some come with suction cups for very wet areas while others come with a carabiner to hang it from a secure location on your boat. Wireless Connection - You don’t need any additional wires to connect a Bluetooth speaker to your smartphone or other devices. They keep your boat clutter free such that you won’t need to cut spaces for speakers and tie down wires. 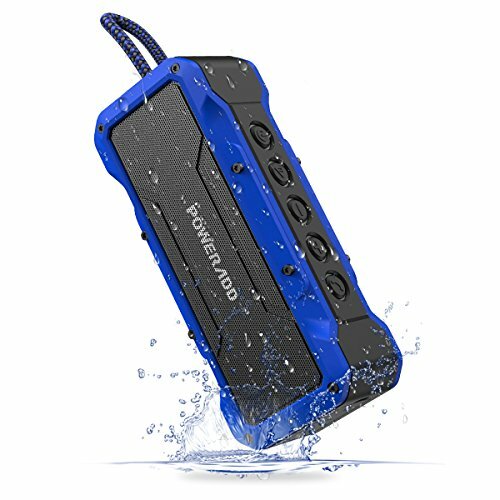 Save on power - Waterproof Bluetooth speakers offer maximum performance with batteries the size of that in your phone. You are therefore saved from extra power draws on your boats battery. They lack Audio Quality - The level of sound produced by Bluetooth speakers will rarely match that of good quality marine speakers. Even at the highest volume they are prone to distortion and cannot reach high wattage for most of the mid-priced Bluetooth speakers. If you don’t plan on having a large party or cruising in rough waters, and are on a budget Bluetooth speakers, are still viable to use on your boat. Water activities are more fun alongside your favorite tunes. You can only achieve great sound on your boat with a quilty marine stereo that fits your needs and budget. We have covered in detail every aspect of choosing an ideal marine stereo. From what specs to look for in receivers to installation tips, we believe this information will help guide your next pick. 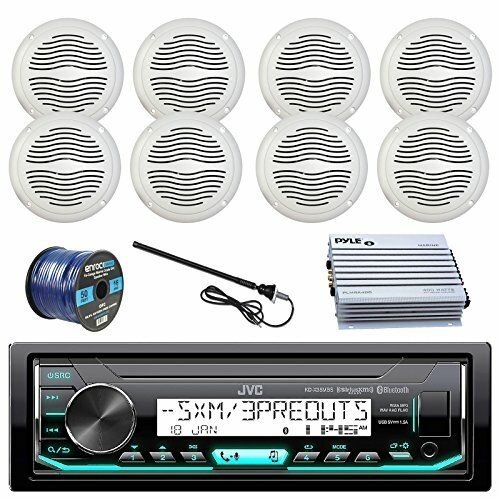 If you are searching for a marine stereo package, JVC gives you a cheap option which is the JVC In-Dash Bluetooth Radio CD USB Receiver Bundle or the mid-range option; JVC Marine Stereo Receiver Bundle Kit. You can also pick a premium bundle or choose single pieces including our favorite receiver from Boss Audio. Now you don’t need to cut your cruising hours to attend a party on the beach, get your crew onboard and give them the partying experience of their lives.